Last April I met 11-year-old Karley Pillsbury, who came to my house with her dad (Doug) to talk about illustrations they wanted me to create for a book she had just finished writing. 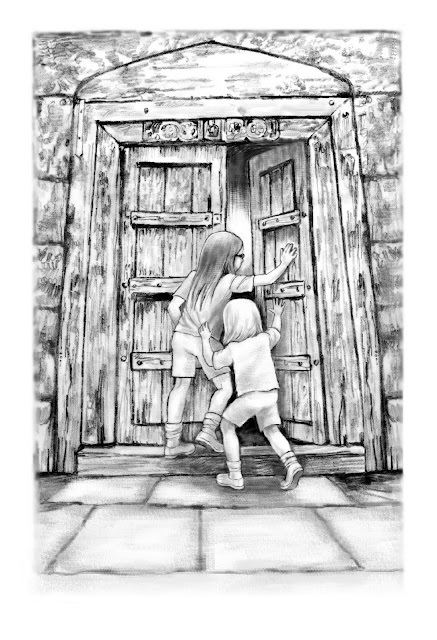 The charming little girl, peering through her tiny spectacles at me across from my drawing board, reminded me of my long-ago self, without the specs, but always with my nose buried in books like the Nancy Drew mysteries. She and her dad described to me what parts of the story they would like to see illustrated for the full-color cover and for ten black and white interior drawings. I went to work along with several other specialists to bring this project to fruition. After nine months of professional editing, some rewrites, book design and layout plus working with a printer, The Girl in the Mirror was published in December 2009 by her dad. Doug wanted Karley, who spent three months writing her book, to learn about the whole process of what it takes to get a book produced, in your hands and ready to read. She was amazed at the amount of time required but very happy with the results. Also, like a true professional, she is already at work on her next book! As for the illustrations, let's start with the cover (at the top of this post). The cover shows the magical confrontation between the title character, Mallory, and a little early American slave girl, Prudence, as they gaze in wonder at one another through a mirror stored in the attic of the family's new plantation home. While developing the preliminary sketches for the cover, I was working with photos that Doug had e-mailed to me of Karley's little sister, Brenna, taken as she posed for her dad gesturing toward a mirror. This helped me capture the pose, but something was wrong. Karley's mom raised the point that maybe the title character on the cover, Mallory, ought to look like her creator, Karley. Everyone agreed and I received more photos, mostly of Karley's head and face in various poses. 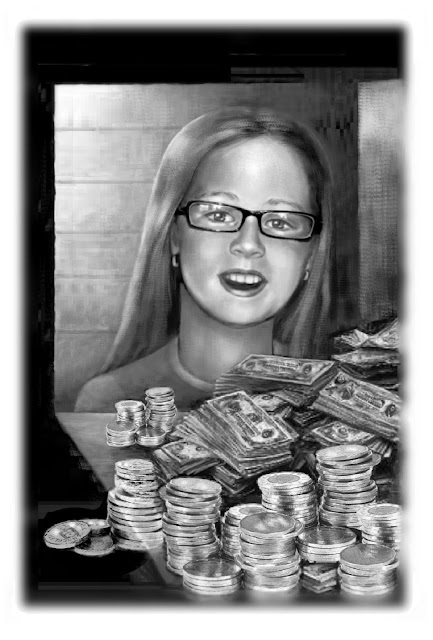 So Brenna then became the model for the little sister in the story, Taylor, and a portrait of young author Karley appears on the cover of her own book! 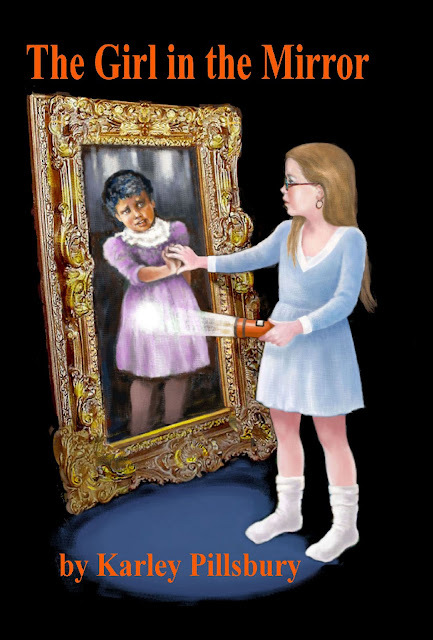 I had to do research on the internet to find antique mirrors to use in the composition, and then another seach for early American slave children to accurately portray what Prudence would be wearing as she reaches out to Mallory from inside the mirror. 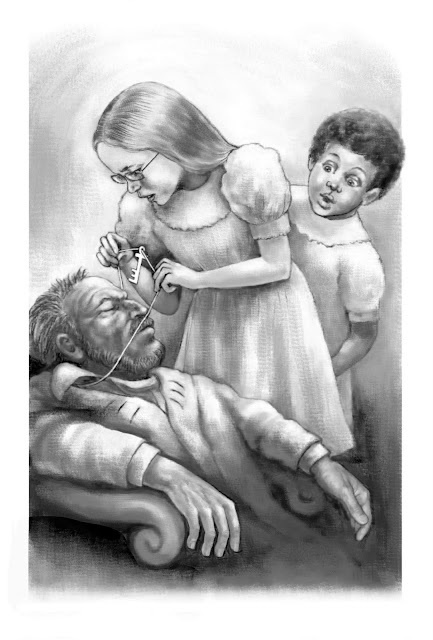 All in all, everyone was pleased with the results and we carried this theme throughout the book; Karley, Brenna and their mom and dad became models for the characters appearing in the interior illustrations. A family affair! 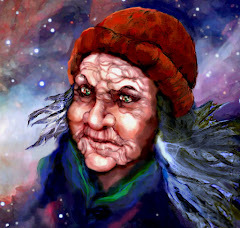 Also, a warm fuzzy for the illustrator: Karley told me that the image I created of Prudence was very close to her own idea of how this little slave girl would look. Mallory and her little sister explore an old carriage house on their new plantation home grounds. Lifting the key to the treasure off the slave-owner's neck. Peering into the hole in the wall at the hidden treasure. Please add the word, ARTS, to your order information on the website.